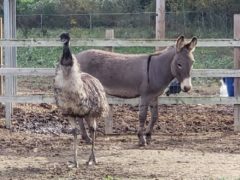 A donkey and an emu who hit the headlines for their unusually strong cross-species friendship have found a new forever home – with Walking Dead star Jeffrey Dean Morgan. Birthday girl Sandra McIntosh had an unusual visitor on her special day in the shape of Donkey Bond, a miniature donkey. A donkey has been turning heads in a Dundee neighbourhood after becoming the star of a church’s Easter celebrations.